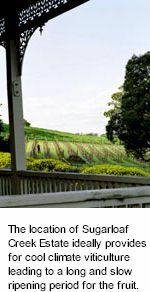 Sugarloaf Creek Vineyard is situated within the rolling hills of the Great Dividing Range, on the boundary of three geographical regions, the Goulburn Valley, Upper Goulburn, and Macedon Ranges. The cooloer climes here translate into a long and slow ripening period for the fruit. Established by the Blyth and Hunter families in 1998, the vines have been planted and nurtured to maturity completely by hand. The entire vineyard is planted with Shiraz PT23 vines on their own roots and is a labour of love, maintained by the two families. Sugarloaf's vineyard slopes towards the east, high on a hill to minimise any potential frost damage. The site is completely dry farmed which means no artificial irrigation takes place, all watering relies on rainfall. The result of dry farm viticulture is that the berries and overall yields are often smaller, intensifying the fruit flavours in the wine. Adrian Munari of Munari Wines in Heathcote is an award winning winemaker producing an impressive range of estate grown wines as well as providing contract wine making services. The fruit grown at Sugarloaf Creek Vineyard is sent to Heathcote where it is slow fermented in open vats and then aged in a combination of new and prior use American oak barrels for twelve months. A deep, vibrant colour. Flavours of dark berries and spice with a distinctly perfumed nose. This is a rich, full bodied Shiraz made with pure and ripe, beautifully defined varietal fruit expressing wonderful cool climate pepper characteristics.